It’s part ride service, part mass transportation and fully crazy. Renault has managed to outdo the craziness of the Mercedes F 015 concept with its own driverless concept electric car, the EZ-GO. Unveiled at the Geneva Motor Show, it's a Level 4 autonomous urban EV with a top speed of just 30MPH. Six passengers enter through the massive front door and can see everything (and be seen) thanks to huge swaths of glass on the sides and roof. The EZ-GO might have low performance, but it's high-tech. All the self-driving sensors, including radar, LiDAR, ultrasound and cameras are stashed in an antenna on the rear spoiler. Even though there's no driver, Renault says it has Level 4, rather than Level 5 self-driving, largely because it's a concept car that will only ever operate on a closed circuit. Still, its tech would allow it to fit into traffic, change lanes, overtake other vehicles and turn at intersections. It can also move into a safe position if the system detects an incident or fault on the car itself. 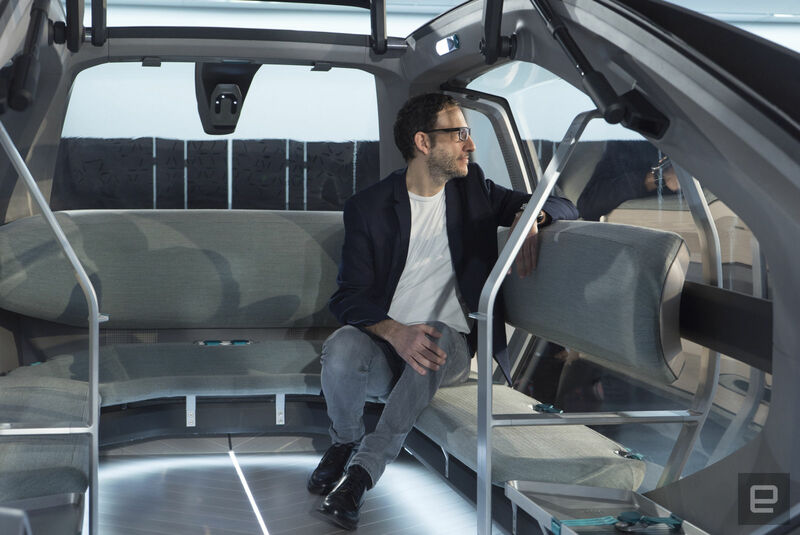 Renault is working on technology that will allow humans to monitor the vehicle, and safety is further enhanced by the front entry door that keeps passengers away from the flow of traffic. The self-driving EV has active suspension that can handle rough city roads and raise or lower the car to accommodate passengers, along with four-wheel steering for better city maneuverability. There are also built-in wireless charging units and WiFi. To access the EZ-GO, you would use an Uber-like app or board from special urban stations. Renault wants to improve on such apps, however, by giving users more choices on how they ride. "If you're a woman and it's late, you could ask for girls-only service," Renault's manager of concept cars, Stéphane Janin, told Engadget. "Then it becomes a riding pool with no driver and only women in the vehicle so that they will feel safe." While it might look like an arty design exercise, the EZ-GO makes sense when you understand what Renault was trying to do. The combination of a huge entry port at the front and the U-shaped seating arrangement allows passengers to walk in standing up, easily sit down and move around. At the same time, there's a ramp that gives easy access for wheelchairs or parents with strollers. The half-circle seating arrangement and copious glass serves another purpose, too. "For the shared pool mode, you might not always feel comfortable when you are in a normal car and passengers you don't know are behind you," Janin explained. "That's why we decided to make this U-shape. People are more or less facing each other, so they can see everyone and say hello." Another survey told Renault that passengers feel more comfortable in a transparent vehicle. Unlike with private cars, people want to be seen in transit vehicles so that other passengers can't try anything funny. "When you are in our car, on the bench seat and beside a big window, it's like you are on a park bench that's somehow moving," noted Janin. The automaker thinks the EZ-GO could accommodate sightseeing, evening parties and other activities besides ride-pooling. The semi-circular seats create a convivial atmosphere with lots of room to move, and the panoramic glass lets you see what's going on. "Because it's a super-transparent cabin, you can see everything outside and take pictures," said Janin. "So you could say, I don't want to go from A to B, and the service could take you on a 20- or 40-minute tour instead." Where Uber calls itself "everyone's private driver," Renault sees EZ-GO as an affordable, more sociable service. We've designed it according to the needs of the cities," said Janin. "The idea is to use autonomous and EV tech to allow mobility for all." As such, an EZ-GO-like service would provide more freedom to folks who can't afford to own a car or can't drive, including the young and elderly. It would also improve cities by reducing traffic, pollution and parking demand. The automaker thinks that autonomous and electric cars could provide not just mobility, but energy storage. It recently unveiled a smart island at Santo Porto, Portugal, with Renault Zoe EVs, solar and wind power, and battery backup systems. The idea is that during off-peak times, folks could charge up their EVs, and when power demand is high, they could discharge some power to the grid. The EZ-GO could do something similar in cities while it's not in use. The EZ-GO wouldn't be sold to the public but is aimed at cities and businesses for transit and private ride-sharing. For passengers, the aim is to make it cheaper than an Uber or cab, but more than a bus. Renault sees it as being useful for pool-type ride-sharing as a way to replace shuttles, and even for tourist use. The EZ-GO is helping Renault prepare for the day when (and if) true robo-driver services start. That will inevitably reduce the demand for private cars, so all automakers are scrambling to develop their own ride-sharing tech. For now, though, Renault still makes most of its money from gas-burning vehicles. However, Renault said it will release its first EZ-GO-style robo-vehicle in 2022, and that's not terribly far away.